Video: It’s one of the most powerful weapons in your online marketing arsenal, and you don’t need to be the next Spielberg to make it work. Here are a few basic tips to get you started. If your business requires some outdoor filming, try to keep an ear out for any intrusive noise. The wind is a particular nuisance, and takes a special pleasure in ruining the great dialogue you spent ages crafting. Stay away from heavy traffic as well (a good tip in general), and be prepared for a second take if a poorly timed plane should fly overhead. If you’ve got access to a recent smartphone, iPhone or GoPro, then you have everything you need to start filming right in your pocket. The video quality will be more than good enough for a website, Facebook page or True Local listing, so don’t worry about hiring out expensive cameras. An obvious one, but still worth mentioning. Shaky cam may be a popular choice for Hollywood fight scenes, but it has no place in the world of online promos. If you find your hands moving slightly while you’re filming, try holding your breath during the shot. It works wonders! When attaching your video to an email or uploading it to Dropbox, you may sometimes be given the option to change its size. Always ignore it! You don’t want to be tampering with the size or quality in any way, as it could cause a lot of headaches later on. If your business requires skilled hands, let’s see them in action! Footage of your hands tiling a roof, changing a drainpipe, kneading some dough or pouring the perfect pint is exactly what your customers want to see. It demonstrates the quality of your craftsmanship like nothing else, and assures people you know exactly what you’re doing. We don’t have to get super technical here (no need to spend hours find the midpoint), but a mixture of wide shots and close-ups can really add a sense of professionalism to your video. If you want to show someone shovelling, try a close-up of their hands on the shovel followed by a distant shot of them working. If you’ve got time, film the same thing from multiple angles and distances, and see which footage looks best while you’re editing it all together. We’ve already talked about their hands, but it doesn’t hurt to show the rest of the team as well. Include some footage of staff in their natural working environment, and try to capture the humour, personality and comradery that makes them special. 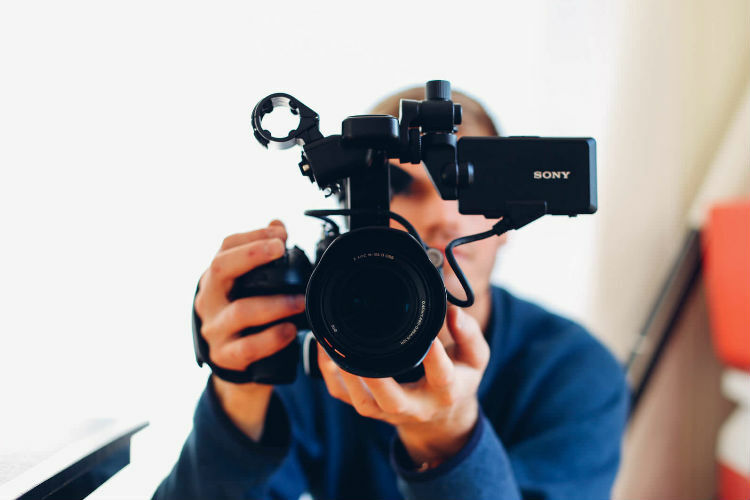 If they’re willing (and let’s face it, they probably are), have the business owner begin the video by outlining the business, giving a brief history and introducing the team. It’s also a great idea to discuss why the business is trusted, how your team strives to satisfy customers, and what customers can expect from the services you provide. It will reflect well on the owner, and give the business a human face to relate to. Quirky ploys? Get them on film! Do you offer free quotes, extended warranties or money-back guarantees? Let’s hear about them! However fun your video may be (and please do make it fun! ), it’s main job is still to convince customers to choose your business. Leave out nothing that could help sway them. It might be a bit cheesy, but it works. If your business has a slogan, have the owner return one last time for a hearty rendition of it. It’s a nice way to end the video, and what’s the point of a slogan if nobody’s going to hear it? Be proud! That should just about cover it – good luck and happy filming!